I am Robinson from Nigeria. I came for my mother’s ovarian cancer surgery in India through Forerunners Healthcare Consultants. My mother was struggling with cancer from 2 years. 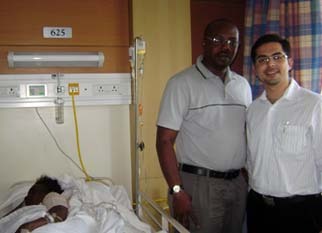 We had a lot of treatment and medications done in Nigeria for her ovarian caner but it was proving to be just temporary. Nigeria lacks good infrastructure and this can be the main reason for not getting good treatment for my mother’s ovarian cancer surgery. Then I started searching abroad for an easy alternative. Then my friend referred me Forerunners Healthcare Consultants in India. My friend had his treatment done through the same company, and he told me that he got the best medical facilities and services in India through Forerunners Healthcare Consultants.